In 1992 Château de Cabidos created a small but very high quality vineyard, between the areas of Jurançon and Madiran. The vineyard sits on 20 acres of clay-limestone soil. 16 acres are dedicated to the production of Petit Manseng, 1 acre is Chardonnay, 2 acres are Sauvignon and less than 1 acre is Syrah for making red wine, although this is being gradually increased as there is such demand. 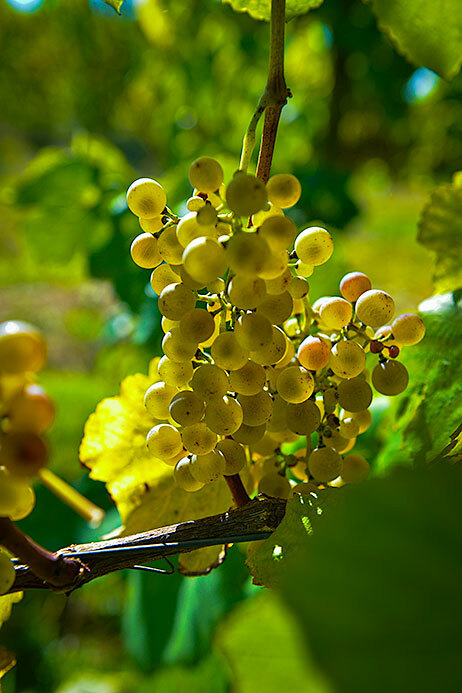 The most important grape at Cabidos is the Petit Manseng, a grape native to the Pyrenees. It is a grape that ripens late in the season and is particularly well suited for the production of great, sweet wines. It is an aromatic variety, which is distinguished in its youth by notes of peach, citrus and medlar, with a hint of cinnamon. It is remarkable for its ability to concentrate the sugar in the berries during maturation, whilst maintaining a high, natural acidity. It is an ideal grape for the climate in the Béarn because we are blessed with long, sunny autumns that allow ‘passerillage’. That is to say, the grapes can dry naturally on the vine, which gives them a high sugar concentration and the development of complex aromas of candied fruit, ideal for exquisite sweet wines. It has very exotic flavours, such as pineapple and mango, and with time the wine reveals aromas of white truffles. Our dry Petit Manseng can be enjoyed as an aperitif, served not too cold at around 12°C, with slivers of parmesan or aged Gruyère.The sweet Petit Manseng is a perfect marriage with foie gras and can also accompany fruit desserts, especially those made with exotic fruits such as mango or baked pineapple. Syrah is a powerful grape giving wines of character. 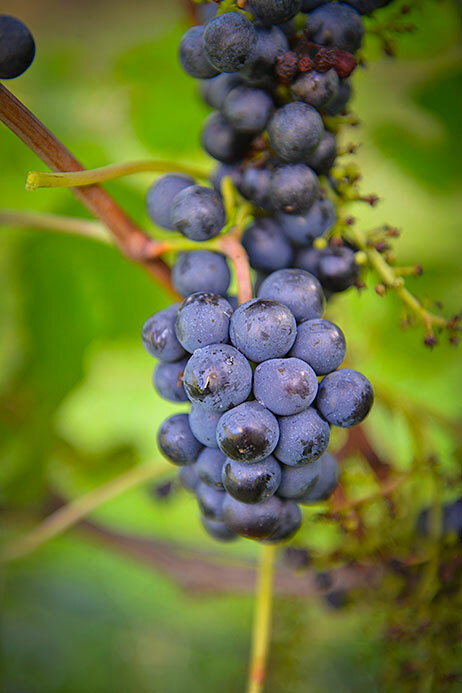 According to legend, Syrah is of Sicilian, Persian, or Syrian origin but DNA analysis in 1998 showed that it actually originated in the Rhône-Alpes region of France. Syrah is one of the most emblematic red grapes of the northern Côtes du Rhône, yet it is grown all over the world and due to its popularity it is being planted more and more. Currently there are over 450,000 acres grown throughout the world, including in Argentina, South Africa, Italy, Chile, New Zealand, and Mexico. It is a variety that gives a low yield and so is considered rare and precious. The grapes give a dark color, it is aromatic and fairly alcoholic, with medium acidity and smooth tannins that can age well. It shows excellent fruit aromas (both red and black fruit: raspberry, red-currant, blueberry and blackberry) together with peppery spice. As it ages, the youthful floral, violet scent evolves towards more marked notes of musk, truffle and pepper. Chardonnay is in fact named after a village in the Mâconnais. It is a well-known and successful grape as it adapts well to many differing climates. It is found in most wine producing countries, however, it only represents 4% of all wine grapes and it is estimated that Chardonnay can be found on around 475,000 acres worldwide. At Château de Cabidos, Chardonnay is grown on 1 acre of land facing south to south-east. It allows us to create a dry, white wine which is fresh, well-balanced with good fruit. The nose has notes of pear, honey and a touch of quince and with age the bouquet becomes more complex with nutty aromas. It can be served as an aperitif, or matched with fish with lemon, perhaps cooked in a parcel ‘en papillote’ or roast chicken. Sauvignon is a classic white grape which produces fresh, aromatic dry white wine which can be appreciated from a young age. The Sauvignon grape originates in the South-West of France. There are around 265,000 acres grown throughout the world but France remains the largest producer. It is pale yellow in colour with hints of green in its youth. It often smells of gooseberries and passion fruit, whilst the palate is fruity and lively with a touch of grapefruit at the end. The wine has an explosion of aromas and it pairs well with seafood, salmon with dill, goat cheese, or Nicoise salad. At Cabidos we make an unusual but very successful blend of Sauvignon with Chardonnay and a touch of Petit Manseng. The three varieties complement each other perfectly.